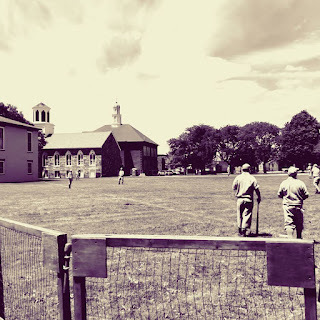 BRISTOL, R.I. -- The Providence Grays vintage base ball club (10-4) held an exhibition 1864 doubleheader on the Town Common in Bristol on Saturday, June 16, in front of an intrigued crowd of locals as part of the Fourth of July Committee's festivities. 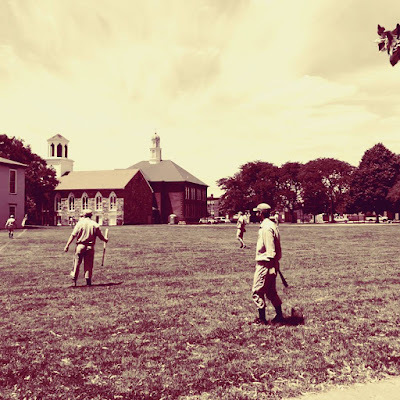 As Providence's opponent for the day was unable to field a squad, the Grays opted for an exhibition series between two evenly matched picked nines comprised of Grays regulars as well as a few Bristol firefighters, family members, and friends of the players. A rollicking good time was had by all, and the Grays took the opportunity to share their love of the old game with many new faces as they sharpened their skills in preparation for next weekend's festival in Maine. The event commenced in traditional fashion with the Pledge of Allegiance and the throwing out of the first pitch by the winners of the parade pageant. 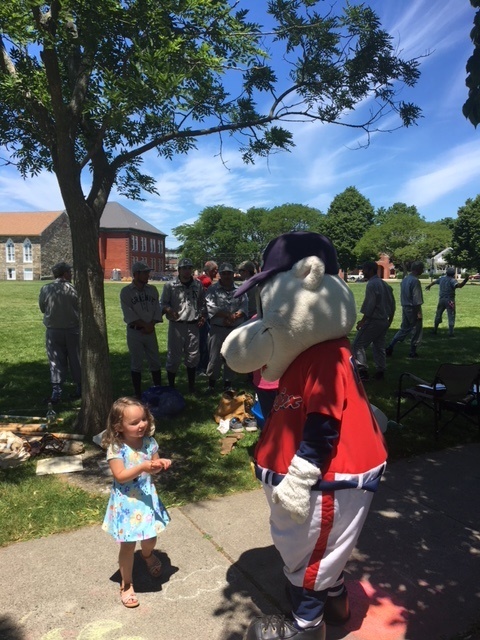 Representatives from the Pawtucket Red Sox were on hand to commemorate the history of the pastime and to celebrate the summer festival. The Committee supported the efforts with hot dogs, chips, and beverages available for players and spectators alike. 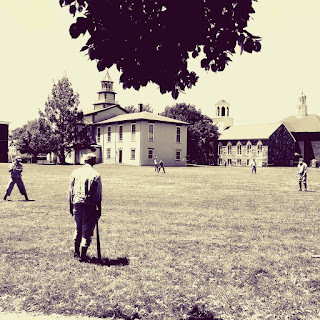 The two Grays squads, mixed with many players for whom this event was their first attempt at playing by the old rules, battled evenly throughout the day, with the first match decided by an 11-6 tally after nine, and the second game running through the frames to finish 6-2 to close the day. The fans in attendance witnessed sundry feats of derring-do in the field, with some exciting put-outs by shortstop Mike "Defense" Duggan and left fielder Johnny Carlevale, along with clutch plays at first by Charlie Dryer and Brian Travers. New players performed admirably in the field, getting a taste of defending their positions barehanded and grappling with the prospect of recording a hand on the bounce. John Coccio, a Bristol Firefighter, recorded an out by snagging a line drive that came screaming off the bat directly to him at second base for the first out in the ninth inning of game two. Young Dane Watson, son of Grays veteran Dave "Grandpa" Watson, made several impressive snags off the bounce for put-outs in right field and notched a clean base hit in his first appearance on the vintage diamond. Jon "Bones" Henson pitched 18 frames in preparation for next weekend's outing and struck well at the plate with runners in scoring position. Tony McClellan dazzled at third base in the first game, snagging a sharply-hit line drive off the bat of Connor Pirrucello-McClellan and nailing the long throw to first for put-outs on several occasions. Jerry McCormack and Grandpa consistently crushed the ball in their plate appearances, as did the reliable captain Travers. Connor and Aidan Pirruccello-McClellan commanded the respect of all base runners and made any striker dread a bouncing foul tip as they each excelled behind the plate. 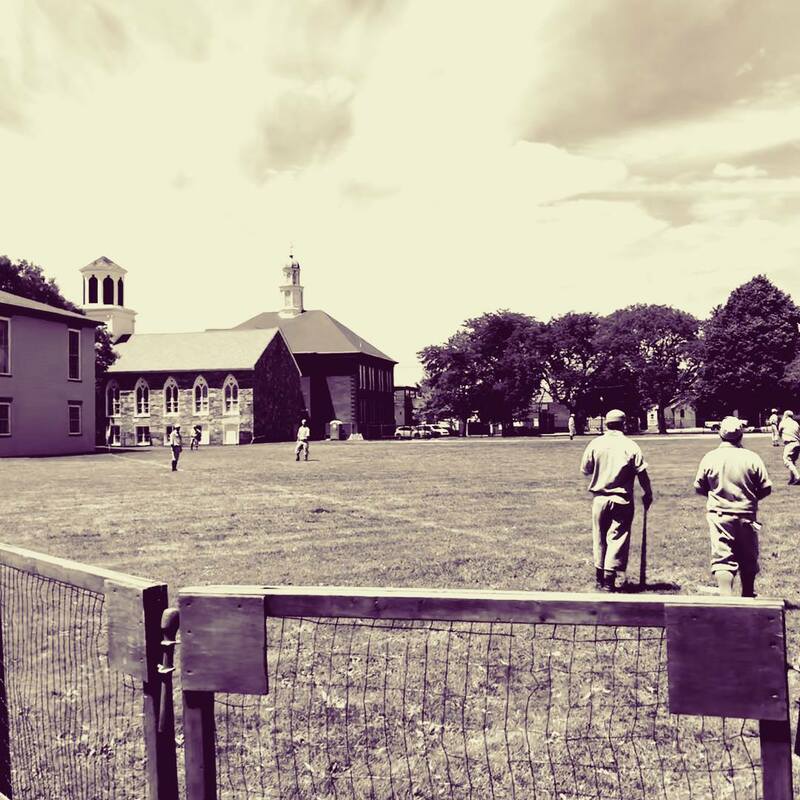 Next up, Providence travels to Cornish, Maine, on June 23 and 24 for the New England Vintage Base Ball Festival. Saturday's opponents include the Dirigo BBC of Maine and the Base Ball Club of Hingham. 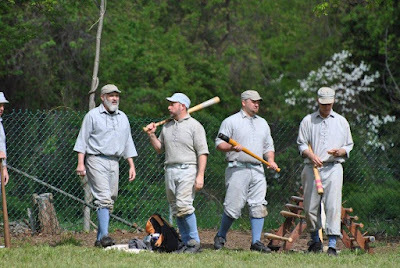 On Sunday, Providence faces off against local rivals the Boston Beaneaters followed by the final match of the weekend versus the Mechanics BBC of N. Andover, MA. Follow the Providence Grays Facebook page and Providence Grays News for updates and previews.